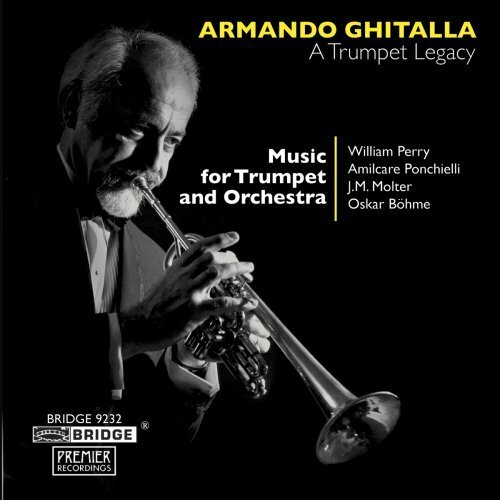 This CD is a tribute to Armando Ghitalla (1925-2001), one of the outstanding classical trumpet performers of our time and considered among the finest teachers of the instrument in the latter decades of the 20th Century. These are Ghitalla’s final studio recordings, and it is appropriate that the selections represent music that he most enjoyed performing during his long and distinguished career. 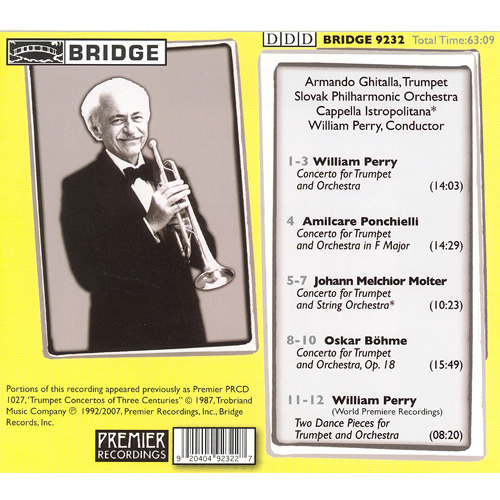 Included are three colorful pieces written for the soloist by William Perry: the popular Trumpet Concerto and the Two Dance Dances for Trumpet and Orchestra. The first of these dances is a lyric bolero called “Mediterranean,” and the second, “Imperial Waltzes,” is a glittering technical display piece evoking an opulent ball in the days of Czarist Russia.